We’re very pleased to introduce a new member of the AxiDraw family: the special edition AxiDraw SE/A3. This new model joins our existing models including the AxiDraw V3 and AxiDraw V3/A3. Like the AxiDraw V3/A3, the AxiDraw SE/A3 has an XY travel suitable for use paper up to 11×17″/A3 size. 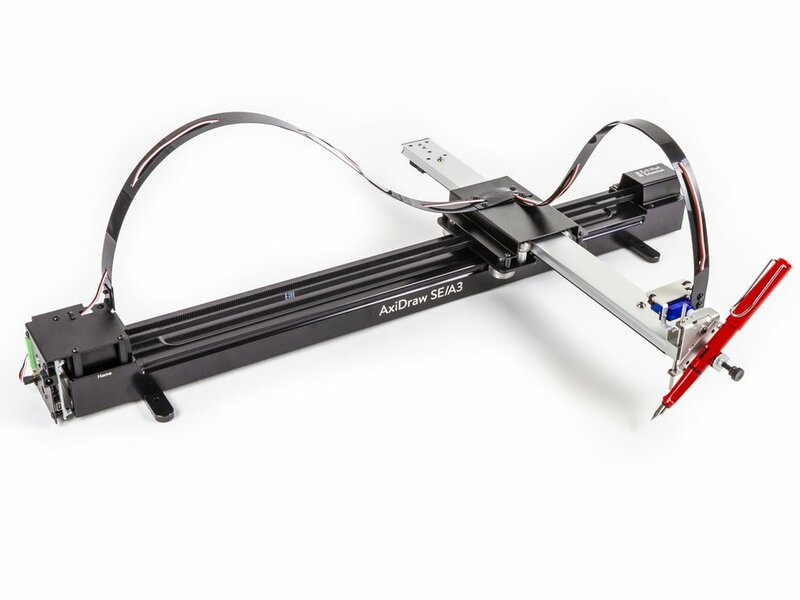 However, in place of the central extrusion that makes up the body of that machine, the AxiDraw SE/A3 has a central beam that is CNC machined from a solid billet of 6061-T6 aluminum, and then anodized to a sleek black finish. This heavy, rigid structure — it’s a solid block of metal! — provides dramatically better straightness and stiffness, even compared to the already-stiff AxiDraw V3/A3. This design adds mass exactly where you want it: to the non-moving base that forms the X-axis of the machine. In order to keep the weight light where it matters, the moving Y-axis of the AxiDraw SE/A3 uses the same stiff and light custom aluminum extrusion that we use on the AxiDraw V3/A3. The AxiDraw SE/A3 is available to order now at the Evil Mad Scientist shop. This entry was posted in CNC, Engineering, Evil Mad Scientist Shop, Robotics and tagged AxiDraw, cnc, plotter. Bookmark the Permalink.